Catering to the requirements of our clients, we are involved in manufacturing of Wedding Card Scroll Stick. Owing to our enriched industrial experiences, we are committed towards providing a wide variety of excellent quality Scroll Wedding Card. Our stunning collection of Scroll Wedding Invitation Card Invites are unique and add royal touch to your invites. 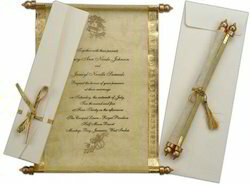 These classic Scroll Invitations will captivate the hearts of your guests with their great workmanship. We can customize any one of our invitation to match your wedding theme. We also provide printing service. Royalty all over the world has used scrolls to communicate important events. Make your guests feel special by sending a scroll type wedding invitation for the wedding in your family. These cards are hand crafted using rich textured Resham paper. Choose from a sea of festive and brilliant colour options. Also the ultimate style and fashion statement, these cards are a class apart. White colored silk handmade paper roll open card farman style scroll invitation card on 200 gsm paper. Box is made of 300 gsm thick same-colored handmade paper. Scroll has silver bars and tied with silken tassel. The box is tied with a silver zari ribbon. The set comes with an outer envelope in same silk handmade paper to be used as mailing envelope. Traditional Velvet cloth scroll wedding card come with box type envelop. - Weight - 34 gm. 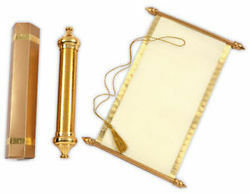 Wooli scroll card with metallic box n gold foil tray with ribbon to knot the scroll in voilet colour theme. In earlier times, the kings used to send their invitations on the clothlike surface duly caligraphed with golden-silver border and so on. The scroll card represents the old idea in modern times.